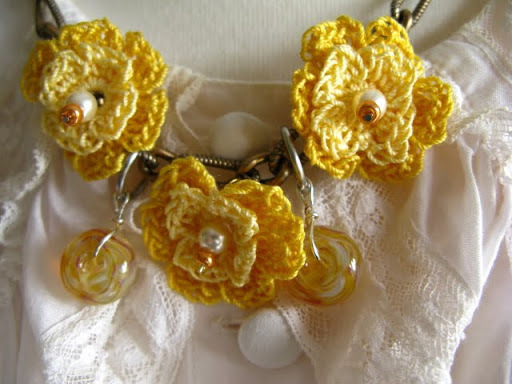 Sun and light, yellow and amber, a cheerful necklace that brightens…. I enjoy using vintage materials that I have – unused stock, usually made in Japan – and combining that with components that I purchase from different artisans on etsy. embellished with beautiful borosilicate glass beads, crocheted delicate blossoms, and handmade stainless steel closed loops. This necklace reminds me that the sun always shines…even when I can’t see it, …it is there. And that the Light of Lord Jesus shines always, through it all…even, and especially, when it doesn’t feel like He is there…He is.